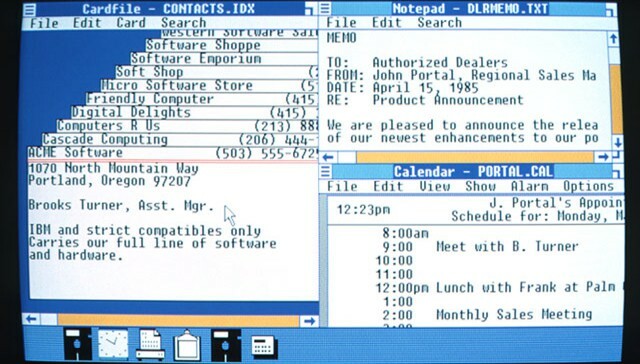 This is how Windows 1.0 looked when it shipped. November 10, 1983: Microsoft tells the world about an upcoming product called Windows, which will bring the graphical user interface to IBM PCs. At the time, Apple doesn’t view Windows as much of a threat. That doesn’t take long to change, however. When Microsoft first revealed its plans for Windows, Apple had just introduced the GUI to the general public with its ill-fated Lisa computer. The Lisa’s operating system, like Windows, drew inspiration from pioneering work carried out a decade earlier at Xerox PARC. Compared to the Lisa, however, Windows 1.0 looked incredibly limited. Microsoft’s software engineers based it on the same concepts of pull-down menus, mouse support and tiled windows. However, they failed to pull it off. Windows did do one thing that grabbed people’s attention, though. It appealed to customers with its low pricing of just $99. By the time Windows 1.0 launched, Microsoft was best known as a developer for the Mac. After Steve Jobs left Apple in 1985, Microsoft used its position as the maker of Word and Excel to strong-arm Apple CEO John Sculley into signing a deal granting Microsoft “non-exclusive, worldwide, royalty-free, perpetual, nontransferable license to use [parts of the Mac technology] in present and future software programs” for its then-fledgling Windows. Not seeing the potential of Windows, Sculley agreed to the deal. It wasn’t until version 2 of Windows, which looked suspiciously similar to Mac OS, that Apple sued Microsoft for copyright infringement. Microsoft then went from strength to strength, as PC sales went through the roof during the following decade. At the same time, Apple faltered. The long-running Microsoft-Apple legal battles ultimately got resolved in August 1997, when Cupertino agreed to drop all lawsuits against its rival. By that point, Microsoft was nearing the height of its post-Windows 95 power. And Apple was ready to start climbing back to the top of the tech industry. Were you a computer user in the early days of Windows? Leave your comments below.